Observing fog, dew, frost and mist may seem unimportant for some people. However, knowledge of these weather phenomenon can be useful and for some people crucial. For each to form, there must be the appropriate conditions to achieve condensation, (and sometimes sublimation in the case of frost). Fog and dew can be measured despite the fine size of the water droplets. The dew gauge is used to measure the light droplets through weight. Fog can be described as a cloud forming very close to or at ground level. It requires air with sufficient moisture to cool or to be cooled to a temperature to achieve condensation. Once condensation occurs, visibility decreases dramatically. It therefore becomes very hazardous. Fog does not necessarily have to be uniform, or widespread. Some areas may have thick fog whilst others may miss out completely. Fog is more common in valleys and near creeks or streams. It also most commonly occurs overnight and during the morning. However, in colder climates where fog is more common, it may last all day. 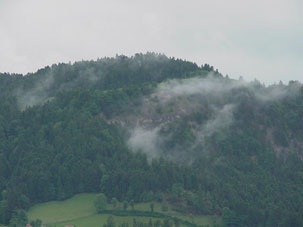 From a distance, fog is observed to be similar to a cloud on the ground especially when it is thick. If the air is sufficiently warmed by the sun to raise the temperature above the temperature level needed for condensation or if wind begins to blow, the fog will begin to break into patches. It may rise to higher level in the form of fast moving low clouds and eventually clear. Mist is similar to fog except it may appear more ragged and forms on rainy days with the air saturated due to the amount of moisture. 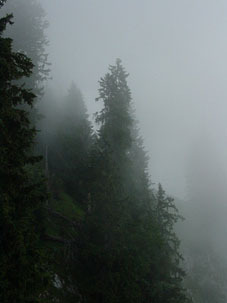 Mist is more common in mountainous and forest regions. Dew is moisture that condenses at the ground level. The layer of air within about a metre above the ground experiences rapid changes in temperature from day to night. Therefore the temperature may be cooler on the ground than the air above. Consequently, the air temperature close to the ground may cool to below the level needed for condensation. Moisture therefore is observed on grass and on the surface of some objects such as those with metal surfaces. If the air above also cools below the condensation level, fog will form. Frost is observed as ice crystals mostly on grass. It basically forms when dew freezes because the air temperature falls below the level necessary for freezing (from liquid to solid form of moisture). However, frost may also form under the process of sublimation when water vapour is cooled so rapidly it forms ice (from gas to solid form of moisture). above the surface to air at the surface. It is therefore common for areas with little or no sloping to receive more frost and fog than adjacent areas with steep slopes. Air at night usually moves much slower than during the day. However, areas with steep slopes normally have wind flowing down hill on what should be a calm night elsewhere. This air movement may be sufficient to prevent frost and fog forming. Finally, buildings, trees and other objects can reduce the amount of fog, frost and dew observed. Such objects are at a temperature higher than the surroundings because they cool more slowly. Water, also has this property and therefore areas near oceans, rivers and lakes receive less frost than adjacent regions. However, because of the amount of moisture available, fog can still occur again depending on the typical temperatures.